Am I a Shih-Malkie or a Mal-Shihkie? Mummy said it’s takes too long to tell people what I am – any thoughts? Actually the truth is no matter what we end up with, Mummy will still have to explain whatever she concocts – because who on earth is going to know what a Maltzu-yorkie is?!?!?! Mummy used to call me Yorkie-poo-poo because she knew I had Yorkshire Terrier in me and then something else. So now that we know there’s no poodle in me, I have to officially apply to be allowed at the Hyde Park Doodles meet. Where do I send my application? 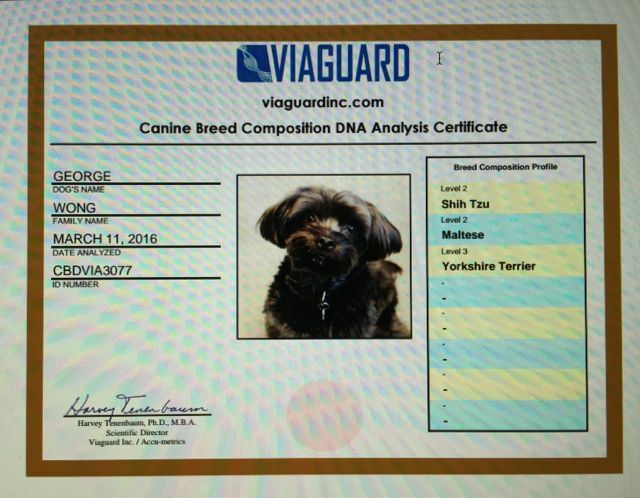 May’s comment: We have the results back from Accu-metrics Canine Testing and George is a cross of small dogs! Shih-Tzu (Level 2), Maltese (Level 2) and Yorkshire Terrier (Level 3). “This category reports breeds that are easily recognizable within your dog. I don’t love him more or less because of his breed. But being able to know his genetic heritage I can be educated about his specific health and behaviour traits. I can be proactive about important factors that he may be prone to, or diseases he may be predisposed to. And to understand his personality as well as exercise requirements. The Shih Tzu is full of character, spunky and happy. They are dignified and at some times arrogant. They are alert watchdogs and like to bark, although they are generally quiet when inside. They need to be with people and make affectionate companions. They may be difficult to housebreak. Major Health Concerns: The Shih Tzu may have ear eye and respiratory problems. They may lose their teeth early, and need regular dental care. They may have spinal disk disease which is caused by their short legs and long back. This problem may be magnified by the fact that they tend to gain weight easily, and may become obese. Lively and playful, the Maltese is affectionate, responsive and fearless. They are good at learning tricks if they feel sufficiently rewarded. They are the perfect companion dog, although they may be difficult to housebreak. They are quick to sound an alarm when they hear strange noises. They love to play, especially outdoors. Major Health Concerns: Prone to skin problems, the Maltese is also easily sunburned. They are sensitive to extreme temperatures. They may have weak digestive systems. They are also prone to Progressive Retinal Atrophy (PRA). Totally oblivious of its small size, the Yorkshire Terrier is always eager for adventure and trouble. While affectionate toward their master, they may be suspicious of strangers. True to their terrier heritage, they can be aggressive toward strange dogs as well as small animals. They are best in households with older children, strictly for their own physical protection. They may be difficult to housebreak. A perfect companion, they require a lot of human attention, but should not be overly spoiled or they may become neurotic. Major Health Concerns: The Yorkshire Terrier may have delicate digestive systems. They may be sensitive to medications and anesthesia. Due to their fragile bones, they can suffer from fractures. They may have herniated disks, spinal problems, Legg-Calve-Perthes syndrome, (a degenerative disease of the hip joint) and Patellar luxation, where the kneecap dislocates. They may be sensitive to cold and rain. Looks like he’s a perfect mix! Got all the good qualities. I don’t know why but I keep laughing at the thought of all the small dogs having hanky-panky on the streets of Hungary! Yorkie-maltzu ? Easy to pronounce and fairly obvious ? 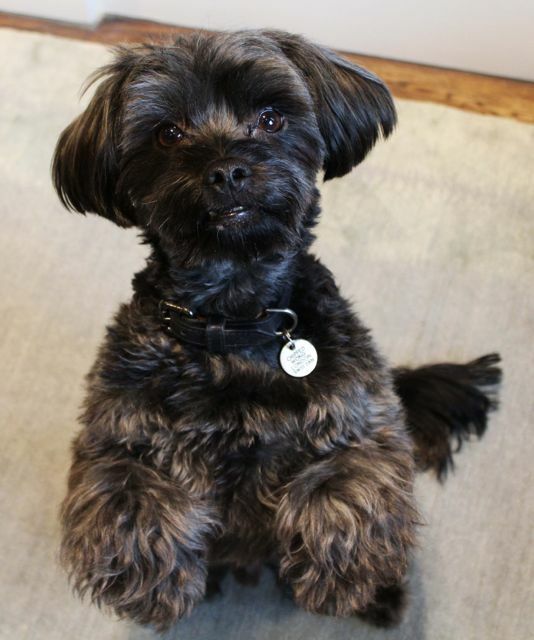 And a logical transition from previous explanations of being probably a Yorkie-poo-poo ! !